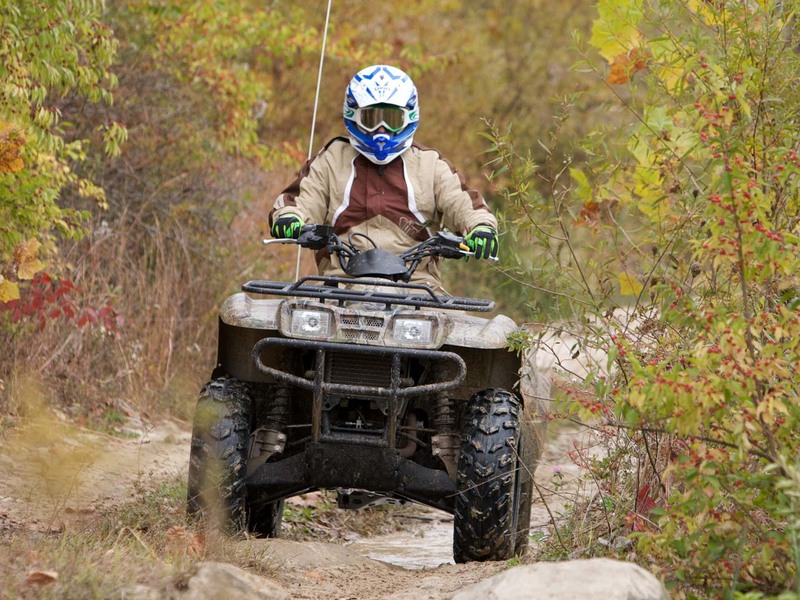 It’s easy to overlook the smaller displacement models in a manufacturer’s ATV lineup. It’s the big bore models equipped with the latest bells and whistles that get the lion’s share of attention, but the fact is many ATV owners don’t necessarily need or want a 70 horsepower, 70+ mph capable ATV to simply tow a trailer around the yard or cruise through the woods on a weekend trail ride. They look for reliability, “rideability,” comfort, and price (not always in that order), and we’ve found one ATV that fits the bill. The Prairie 360 4x4 has been in the Kawasaki lineup for many years. In that time, it has received occasional upgrades, but it has never strayed from its original role as an easy to ride, cost effective ATV. Power comes from a 362cc air-cooled, single cylinder, four-stroke engine that isn’t going to win any races, but it will get the job done. Although the engine is air cooled, an auxiliary oil cooler is located under the front plastic. A CVT transmission makes shifting a breeze, and all that is required of the rider is to select high, low, or reverse with the shift lever just ahead of their right knee, and they’re off. Power from the Prairie engine isn’t going to rip the bars from your hands, but it is torquey enough to pull whatever you need it to. It’s smooth and easy to control, and we consider the rated towing capacity of 1100 pounds to be quite good for a machine in this class. Transmission clutch engagement is good and is well matched to engine power, and there is even a light on the center display that indicates when you need a belt check or possible replacement. We expect this to be a rare occurrence, unless you spend a lot of time pulling very heavy loads, or you constantly get the belt wet in deep water. Maintenance tasks are easy enough on the Prairie: change the oil on a regular basis, replace the spin on oil filter at the front of the engine, and keep the air filter clean. There is even an easy to access oil dip stick located on the left side of the engine! The engine of the Prairie 360 4x4 is not the only feature designed for easy maintenance, though. The shaft drive system, cast aluminum swingarm, and rear oil bath brakes were designed to be care free as well. At the rear of the Prairie 360 4x4 is an aluminum swingarm that not only carries the rear drive shaft, but encloses the oil bath brake system too. The advantage of the oil bath brake system is that it is completely sealed from water, dirt, and dust. We can practically guarantee you will never wear it out. We never have! Suspension at the rear consists of a preload adjustable single shock with 7.1 inches of travel. Front suspension duties are handled by supple, yet sturdy MacPherson struts with 6.7 inches of travel, and each front wheel gets a hydraulic disc brake system. If that wasn’t enough to get you stopped, further speed control is provided by the Kawasaki Engine Brake Control, which uses engine compression to help slow the ATV under certain conditions. Consider yourself well protected! The chassis of the Prairie is a double cradle, steel tubing design that has proven to be very durable over time. Comfort is a big factor for many Prairie 360 4x4 buyers. Whether on landscape duty around the yard or on the way to the deer stand, they need their ATV to fit them, and to be easy to use. Kawasaki engineers did a great job in this area on the Prairie 360 4x4. We found that the controls on the Prairie are well placed and easy to understand. On the left handlebar, you will find the usual thumb switches, but you’ll also have an extra lever for Kawasaki’s incremental differential lock. When you really find yourself in a sticky situation, start pulling the little lever and all wheels will begin clawing at the ground until you’re free. The more you pull, the more power is applied! As with its big brothers in the Brute Force lineup, 4wd is engaged with a thumb switch. You won’t find a digital instrument cluster or even a speedometer on the Prairie, but the center mounted display has several lights for critical engine and transmission functions, such as a belt monitoring system, oil level, 4wd engagement, a neutral light, and reverse. Fuel level is monitored by an old-school fuel gauge mounted just behind the cap, found in the traditional position between your knees. No doubt, styling on the Prairie is dated and even looks as if there is a piece missing on the front end below the racks. However, the Prairie does fit well and gets the job done, true to its workmanlike role. Comfort is further enhanced on the vehicle with a seat that is large, wide, and plush. In addition, serrated, adjustable footpegs mounted just above a sturdy floorboard keep your feet securely anchored while the fenders do a good job of providing splash protection. The Prairie is designed for more than comfort, though. It’s made for work as well. Utility ATVs are modern day pack mules, and a big part of that is the ability to carry a load on the racks. The sturdy, steel racks on the Prairie 360 4x4 are rated for 88 pounds on the front and 154 pounds on the rear. For towing the 1100 pounds it is designed to pull, a hitch is mounted to the rear of the swing arm. You’re not going to pull much without excellent traction, however, and for 2010, the Prairie comes equipped with Maxxis tires at all corners mounted on 12” steel wheels designed for durability. Through the years, the Prairie has evolved, and today the Prairie 360 4x4 is equipped with everything it needs to handle most chores around the farm or yard. Its “back to basics” design definitely helps make it an economical choice for many. You will only find the Prairie’s limits when pulling a very heavy load, where the smaller displacement motor has to work a little harder, or at high speeds. Expect to top out at about 45 mph, but on most trails, that is plenty fast enough. The Prairie 360 4x4 provides exactly what many buyers look for in an ATV: reliability, “rideabilty,” comfort, and price. Since it has been around for many years, there is also a long list of aftermarket upgrades to make it suit your needs even better. Crawling through the rocks, climbing sandy hills, and slogging through the mud are a blast on the Prairie, and we’ve never had a problem. With its heritage, we doubt you will either.